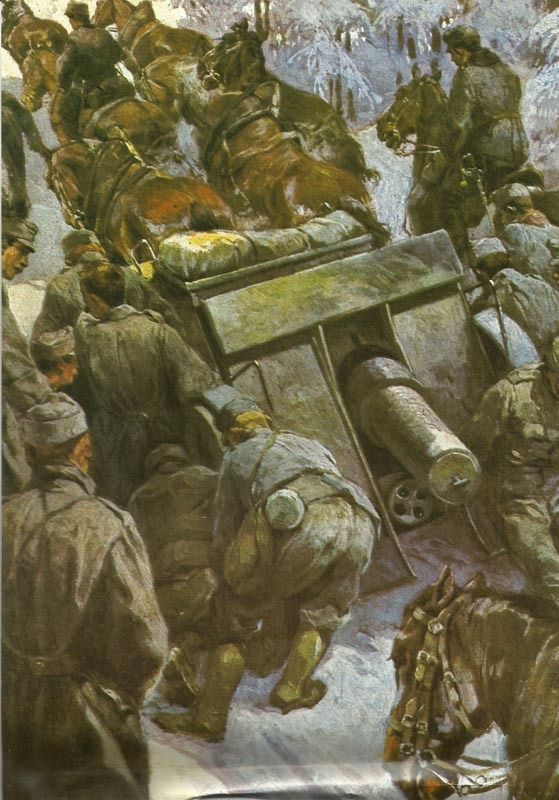 Gun transport by Austro-Hungarian troops in the snowy Carpathians. Carpathians: Austrians retake Dukla Pass and Nowy Sacz. Serbia: Austrian Sixth Army recrosses Sava at Sabac until next day. Artois: Launch of French Tenth Army offensive towards Vimy and Arras delayed till December 17. Argonne­: Dubai’s First Army minor and subsidiary operations cost 9,173 casualties until December 31. Baltic: 2 Russian destroyers lost in minelaying operation off Gotland. Russia: Yaroslavl Gendarm­erie reports Bolshevik factory propaganda. Dvina Military District orders stamping out of ‘signs of socialist propaganda’. Germany: All Catholic Irish removed from Döberitz PoW camp. Japan: Brigade-General Barnardiston (British Tsingtao GOC) arrives in Tokyo, decorated by the Emperor on December 15. Chile: Government protests against AMC Eitel Friedrich neutral waters violation.